For its fourth year, Art Fair East comes to Norwich. 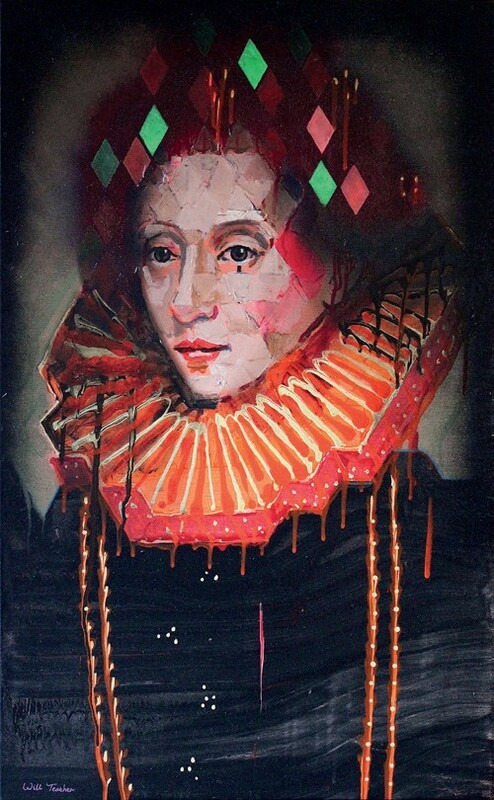 The lady with the ruff is Elizabeth I (after Gheeraerts), an oil on canvas priced at £2500 with Will Teather at the upcoming 'Art Fair East' in Norwich. Its 200 artists and dealers set up their stands over three days for the contemporary art selling show from Friday to Sunday, November 30-December 2 at the St Andrew’s Hall in the city. Will Teather, co-organiser with Brian Korteling, both of whom are artists, said that prices from the selected exhibitors range from £40 to £30,000, so plenty of affordable as well as investment art is on offer. The fair includes art, printmaking, photography and sculpture from artists across eastern England, and, said Teather, from “as far afield as United Arab Emirates, China, Pakistan and Lebanon”. Among the exhibitors is art collector Simon Hearnden, who will be bringing a selection of work by the enigmatic German artist Walter Lindner (1936-2007). This includes a signed monotype trio of faces with added gold leaf priced at £900. EA Fairs, aka Emma Sheridan, will head to the Dunston Hall Hotel, an Elizabethan-style mansion near Norwich set in 150 acres of grounds, on Sunday, December 2. Her 50-standholder antiques and collectors’ fair at the venue is held five times a year.